You may have heard his fingers fly across the keyboards in Karmakanic or Agents of Mercy, and for PC14 he teams up with energetic and impressive drummer Walle Wahlgren from AoM, and a yet-to-be-confirmed bass player. During the spring of 2014 we will see the release of the next solo CD from Lalle Larsson, but can already rest assured that it will appeal to the PC14 audience! 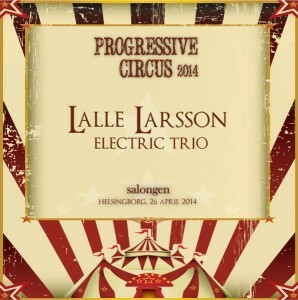 Lalle Larsson is a world renowned keyboard player in the progressive music scene. He has toured worldwide with different bands including headlining many of the major progressive festivals across Europe and in the US. As a solo artist, Lalle has recorded several albums including the DVD Seven Deadly Pieces – “A concert for chamber orchestra and thrash metal band”, and the progressive jazz/rock suite – The Weaveworld Trilogy. Over the years Larsson has appeared on over 40 CDs with various artists such as Karmakanic, Agents of Mercy, Gary Willis, Sebastiaan Cornelissen, Richard Hallebeek, Shawn Lane, Dave Weckl, Phi Yaan-Zek , Marco Minnemann, Virgil Donati, Randy Brecker and Electrocution 250 to mention but a few. Currently he’s touring as the musical director of “Arrival – the music of ABBA”, playing in sold out venues around the world to enthusiastic audiences. In the 2012 february issue of Classic Rock presents Prog Magazine the readers voted Larsson top five in the “best keyboard player” category. Don’t miss the chance to catch him live at Progressive Circus 2014!! !